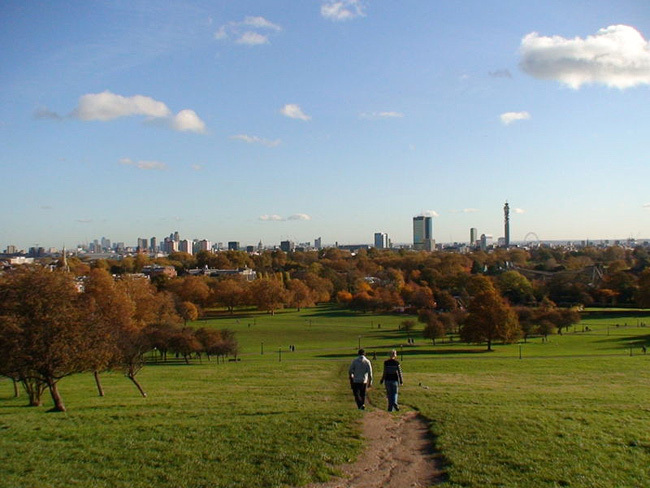 I walked up Primrose Hill once and it is most definitely a perfect spot for a picnic (just be sure to dodge all the yummy mummies and their icandy prams). But perhaps even better than that view, is the view I get when I look down at my nails and spy Butter London’s version of a Primrose Hill Picnic. A gorgeous summery pink that instantly makes me think “fruit salad”. Though, in fairness, it doesn’t take much to make me think of food. The formula was a touch thick and a little draggy which made it one of those “comes good on the 3rd coat” polishes. Not at all unworkable (less thick than BarryM polishes) but worth a mention incase you can’t stand a hint of gloop! Wear was fine for me, 3 days before I noticed any real tip wear and no chipping. The color reminds me a lot of Rimmel’s English Rose, but this looks a bit pinker and brighter, but still way gorgeous. What a gorgeous color, so bright! I love how that pink has a touch of redishness to it! Oh that is such a gorgeous shade!! I can see that on my toes with a pair of peep toe sandals. Course Butter London has become my new love and even better that Ulta now carries it in stores. I love bright pinks like this one! I happened to stop by a Butter London salon today to get a manicure; I got a pale pink shade (Teddy Girl) due to bright shades chipping on my fingers. I’ll certainly have to try Primrose Hill at my local Ulta, because I’d totally wear something like it for a pedicure. Greetings from DC! I just discovered your blog and it’s fabulous! I am a huge lipstick and nail polish junkie so this made my day! I am new to the butter LONDON brand. I was browsing in the cosmetic section in Nordstrom and fell in love with the colors! I bought Come to Bed Red, Chancer, Tea With the Queen, La Moss and Fash Pack. Yeah, when I discover a new brand, I get crazy. Now I am sporting a Blackberry manicure with Come to Bed Red on my fingers and Chancer on my thumbs. The Primrose Hill Picnic color is also lovely. I may go back for that one!